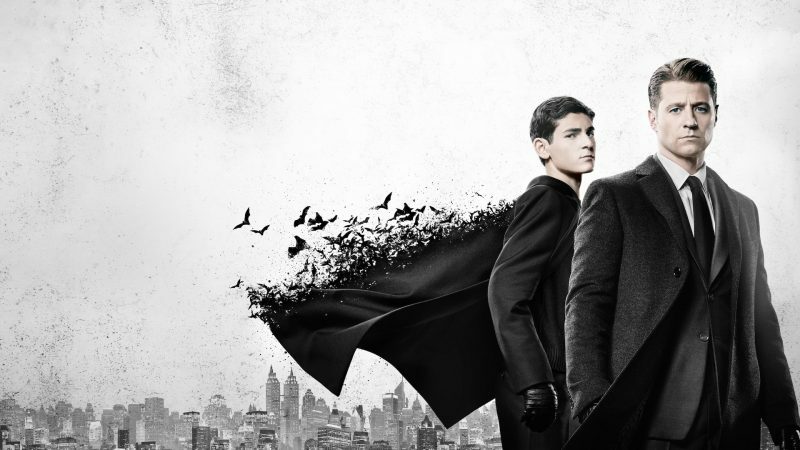 From Pax Penguina to No Mans Land, Gotham season 4 has proved again its one of the best DC shows on television. It’s bonkers, it’s dark, surprisingly extremely emotional and a perfect balance of humour. 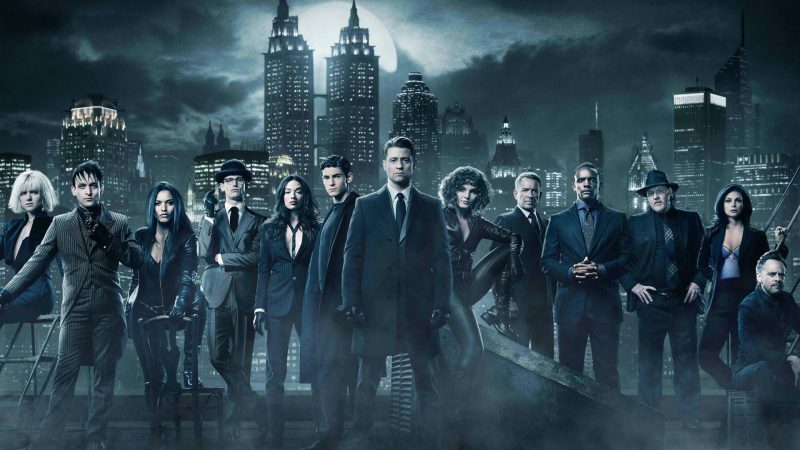 In my humble opinion Gotham has never had a bad season and keeps reinventing itself and telling the origin stories of these wonderful complex characters from the city of Gotham. Every character in some way went through a different transition to get what they needed and where they wanted to be in Gotham. The season started with its creepiest episodes yet as Jonathan Crane was released from Arkham Asylum and became The Scarecrow and used his father’s fear toxin to seek revenge. 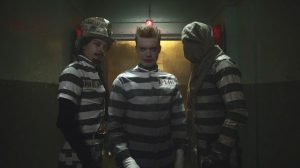 By the end of the season Scarecrow had become part of a team up with Jerome Valeska and Jervis “mad hatter” Tetch in a genius way where they became The Legion of Horribles. 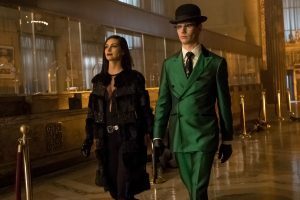 There definitely wasn’t a shortage of Villains in Gotham in season 4. Professor Pyg played by Michael Cerveris made his debut, and it was certainly theatrical. Professor Pyg’s did the most sinister of murders and a stomach churning dinner party with his Gotham pies, which also happen to be people filled pies. Jim Gordon was his muse and the big reveal he had been hired by a Falcone who wanted revenge on Detective Gordon. Sofia Falcone came to Gotham, after her father Don Falcone refused to return to help Jim Gordon take control of Penguin and his crime licenses. Sofia knew exactly what she wanted to do and to be honest her true intentions towards Penguin and Jim were a huge mystery. Robin Lord Taylor’s Penguin did not miss a beat of perfection in this season. The Iceberg Lounge was his fortress, he found himself caring and building a friendship with an orphan boy, Martine played by Christopher Convery. By mid season he had lost everything he owned and he was back in Arkham Asylum for a crime he actually didn’t do this time. 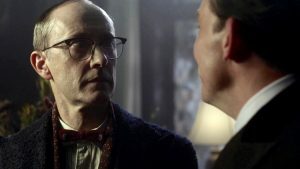 Jerome Valkeska was reintroduced back into this season by becoming Oswald’s neighbour in Arkham, and he was disappointed that after being in Arkham for six weeks Oswald had not tried to escape and hadn’t caused any anarchy. Cameron Monaghan teased about Jerome’s story arc in this season and was excited and incredibly proud of the direction the writers of Gotham wanted to take. Jerome’s died for a second time but we didn’t loose Cameron as an actor on Gotham, as he carried on as Jerome’s identical twin Jeremiah. One of my favourite scenes is when Jeremiah and Jerome meet for the first time since they children. Superbly acted by Cameron Monaghan and it still left you wondering why Jerome wanted so badly to see his brother again. With a parting gift from Jerome to Jeremiah after his death we saw the insanity of Jeremiah, and his true intentions for Gotham. He tricked Bruce to get Wayne Enterprises to build bombs which were disguised as generators so he could make Gotham an island, in which by the end of the season Gotham city was a no mans land. Cory Michael Smith, Edward Nygma also needs a standing ovation as he started the season of as being The Riddler that could not Riddle. With creating an unlikely alliance with Soloman Grundy, played brilliantly by Drew Powell. Butch returned but as a zombie with immense strength which Ed could use to his advantage at Cherry’s fight club to earn money so he could make himself smart again. The wonderful part of this story arc was the surprise return of one my favourite female characters Doctor Leslie Thompkins, who was fixing the bloody and broken fighters at the fight club, whilst she was providing medical help to the people of The Narrows who were still recovering from the effects of the Alice Tetch virus. With some convincing Lee agreed to help Ed find his smart brain functioning again. Lee became Queen of The Narrows and her friendship became strong with Ed creating a convincing chemistry. After Lee diagnosed Ed’s problem with being lack of confidence The Riddler soon returned even though Lee prefers Ed. In another very clever scene which was another highlight of the season The Riddler this time was talking to Ed in the mirror, when normally its vice versa. It took a dangerous round of The Riddle Factory for Ed to admit he was in love with Lee but the fun part of this storyline was who was using who or did they really have sincere feeling for each other? Well they were using each other to get what they wanted but the passion was real and with Romeo and Juliet ending Lee and Ed stabbed each other. Under the orders of Penguin, Professor Strange had the opportunity to fix them. With so many great story arcs involving the principal characters of Gotham it’s difficult to discuss all. Gotham writers developed Bruce Wayne’s story along with loyal butler Alfred Pennyworth to show some of the best fun scenes and some scenes that were incredibly hard to watch because of the difficulties both characters faced when they thought they were doing the right thing. I have always been convinced that David Mazouz was perfect and deserved to wear the cowl and the cape since season 2, and this opinion has not changed. Sean Pertwee was given the opportunity this season to show what life is like for Alfred after being fired again by Master B. Episode 12 gave us a nice back story in how Alfred met Thomas Wayne, as Alfred admits to the waitress he is telling he was on a self destructive path. But Alfred wants Bruce to accept who he really and denying darkness on his own. Bruce just wants to help people and if that means accepting the good and bad of himself he will. Detective Jim Gordon and Captain Harvey Bullock working relationship and friendship was strained from the beginning of season 4 because Captain Bullock was complying with the Pax Penguina licences and Detective Jim Gordon didn’t agree. The biggest fracture that occurred was when Jim was offered the Captains job by the Mayor because Bullock messed up dealing with The Professor Pyg incident. The actual scene alone where Jim and Harvey have the discussion about what Jim has been offered was beautifully acted between Donal Logue and Ben McKenzie. It wasn’t over the top, but you could feel the hurt from both characters. It took quite a few episodes for Harvey to come back to the GCPD, he was willing to do his job as a detective but he wanted Jim to live with his mistakes, one being he got a Falcone involved. Selina Kyle also had a great season. She showed that she was truly the adult in the new trio which was made up of herself, Tabitha and Barbara. Selina deserved to move forward and start earning money and Tabitha was more then happy to mentor her and Barbara was willing to spilt any earnings with her, eventually. Bruce pushed Selina away at the end of season 3, but with admitting that he missed her they reunited their friendship. Selina intervened when Bruce went through his party billionaire boy phase and even was willing to help find Alfred when he was kidnapped. Romance for Selina and Bruce nearly blossomed again but she was tragically shot by Jeremiah. Selina’s diagnosis is that she can’t currently walk so it will be incredibly interesting to see how Selina overcomes this in season 5. Gotham introduced some great guest characters this season. Unfortunately we didn’t see Oswald’s housekeeper Olga but he did have Mr Arthur Penn, played by Andrew Sellon. Mr Penn kept an eye on the licenses that Penguin issued. He had two secrets, how he likes to relax in his spare time at the Bo Sh Sumka Spa and Resort and he was Don Falcones most trusted employee and was asked by him to keep an eye on his daughter and Penguin, but in the words of Bullock he was acting as a triple agent. 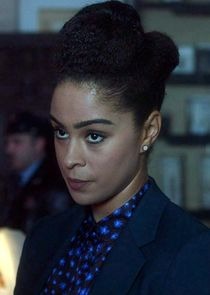 Detective Harper played by Kelcy Harper was a very welcome addition to the GCPD, she is smart, level thinking and not afraid to stand with Jim and Harvey in the line of danger. Peyton List took over from Maggie Ghea from episode 12 as Ivy Pepper went through another transformation. Ivy proved to be even more toxic as just one scratch proved a slow lethal death if you didn’t get the antidote in time. Standout scene between Ivy and Selina was when Selina confronted Ivy about the people she had killed. Selina has always looked out for Ivy, the confrontation was about respecting each other’s lives not reuniting their friendship. The big shocker at the end the season was the death of Butch Gilzean played by the brilliant Drew Powell. 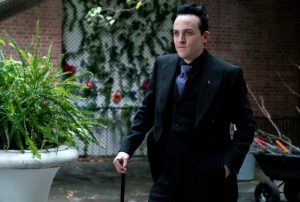 Oswald Cobblepot agreed to help Grundy get back to his original state as Butch. His love for Tabitha was mutual as she tortured Grundy to get him to remember who he originally was, and it worked. Butch and Tabitha were so grateful for Oswald finding Professor Hugo Strange played by the engaging BD Wong. But as soon as Tabitha confessed her love openly for Butch, Penguin shot Butch in the heart out of revenge for Tabitha killing his mother. A revenge he had been holding onto and waiting until for the right moment. Oswald did see Butch as a dear friend and will mourn his death. Oswald warned Tabitha as soon she finds love again he will kill her. The story arcs of the characters and creativity of the show was exceptional. The music, costumes and writing really makes you understand and feel every little feeling of the characters.